The development of the breathtaking Pelican Waters Town Centre & Marina project brings many commercial opportunities. Years in the planning, it offers a dynamic mix of dining, retail and commercial opportunities surrounded by a modern mixed-density residential development featuring cutting edge urban design and a relaxed surf-side atmosphere, offering a range of benefits to future residents, investors and commercial operators. Pelican Waters continues to evolve as one of Queensland’s most desirable destinations to live, work and play with the development of the master planned community’s Town Centre and Marina. Bringing with it a wealth of exciting new lifestyle, residential, business and investment opportunities, the Pelican Waters Town Centre & Marina will create a vibrant new heart for the southern Sunshine Coast while setting new standards for contemporary coastal living. Years in the planning, Pelican Waters Town Centre & Marina is now being brought to life with a dynamic mix of dining, retail and commercial opportunities now available with the precinct offering a wealth of options for waterfront and main street enterprises. Built with convenience in mind, the Pelican Waters Town Centre & Marina will be a destination in its own right offering ample parking, medical hub, gym, childcare facilities, restaurants, alfresco cafes and beautiful waterfront boardwalks. A boating-enthusiast’s paradise, the marina precinct will provide multiple wet berths plus dry stack facility with concierge-style service where boats can be prepped for a perfect, hassle-free day on the water with a simple phone call ahead of time. Reflecting Pelican Waters’ commitment to the highest environmental standards, the marina will offer a refuelling and pump-out point setting new benchmarks in safety and sustainability. Overlooking the stunning marina is the dynamic Town Centre creating the ideal environment for business to thrive and people to connect. Encapsulating Pelican Waters’ passion for eco-friendly, high-quality design, the visually-appealing Town Centre buildings will range from four to six storeys with potential for an iconic feature building up to 10 storeys. Ground and first floors will offer opportunities for multiple levels of business including commercial and corporate offices plus traditional mainstream and waterfront retail. The upper floors bring a new era of residential living for the southern Sunshine Coast featuring a range of contemporary lifestyle apartments to suit all tastes and budgets, with Pelican Waters’ best attributes on the doorstep. Taking good looks and liveability to a new level, the development will include walkable foreshores extending from the marina and town centre hub to the existing Pelican Waters Tavern and local shopping centre complete with Woolworths and Coles supermarkets. Numerous opportunities for social interaction, fitness and leisure will be carefully integrated, with an impressive three-hectare Village Park adjacent the Town Centre set to become one of Pelican Waters’ most popular destinations to relax, recharge and reconnect. Streets are designed for ease of vehicle access plus safe pedestrian and cycle use with the scope to be closed for special purposes such as markets and cultural festivals. The project’s epicenter, the Town Centre Island, will offer CBD inspired higher density living close to main street businesses and alfresco eateries while enjoying a world-class waterfront setting, marina views and sea breezes. Pelican Waters is easily accessible with excellent road, rail, sea and airport links to the rest of Australia and international destinations. Located approximately five minutes from Caloundra, which is the major urban, retail and commercial centre for the southern part of the Sunshine Coast and 20 minutes south of Maroochydore. Just over an hour’s drive from the Brisbane International Airport and Port of Brisbane. Thirty minutes drive to the Sunshine Coast Airport which provides direct access to major Australian capital cities and New Zealand. Pelican Waters offers commercial opportunities at a commercial hub “shared office space” to enable like-minded businesses to conduct business and meet clients in a professional setting with water views and high end facilities. There are options to lease or purchase strata titled commercial space with fibre-optic, microwave and wireless technology enhancing business capabilities. Pelican Waters is the gateway to Bribie Island and Pumicestone Passage conveniently located one hour’s drive north of Brisbane. Pumicestone Passage stretches for 35 kilometres from Caloundra in the north to Deception Bay in the south encompassing a meandering system of channels, sand banks and islands serving as a regional aquatic playground for boating, paddling, fishing and swimming. The only facility on the Sunshine Coast that provides a Marina offering 80-100 wet berths and up to 200 dry berths (boat stacker). The boat stacker will provide convenient, cost effective, undercover storage for boats – No towing, parking or boat ramp queues. The boat stacker will enable people living in a unit or on a smaller lot to own a boat and store it securely. One call and their boat can be fuelled and ready to go. The marina berths will be located within a titled lot under private ownership so there is no need for seabed leases. Marina provides secure, protected accommodation for boats up to 12 metres. Bridge height – approx. 4.3 metres clearance under bridges at mean high tide. Boats 14.7m in overall length, 13.8m in hull length with beam max of 4.54m can travel through the lock and under the bridges at Pelican Waters. In excess of 15,000 boats registered on the Sunshine Coast (QLD Department of transport and main roads as at 30 April 2016). Of the boats registered on the Sunshine Coast, 40% are 3-4 metres, 21% are 4 – 5 metres and 13% are 5-6 metres. In total over 98% of boats are 12 metres or less. Multiple opportunities for developers to undertake a range of medium density product. Located on the island stage, most sites will be afforded high end amenity views either waterfront, park front or town centre focused. There is a growing demand for high end down sizing options in Pelican Waters with the ageing population preferring to stay in the suburb rather than move. Options for a range of heights from 2-6 storeys with one tower to 30m. Opportunities for high end terrace row housing 2-3 stories, located either on the water or with views of a 3ha village park. The proposed Pelican Waters Medical & Professional Centre (PWMPC) is to be located at the gateway to the new Pelican Waters Town Centre and is centrally located to serve the catchment of both Golden Beach and the rapidly expanding Pelican Waters on the dynamic Sunshine Coast, Queensland. 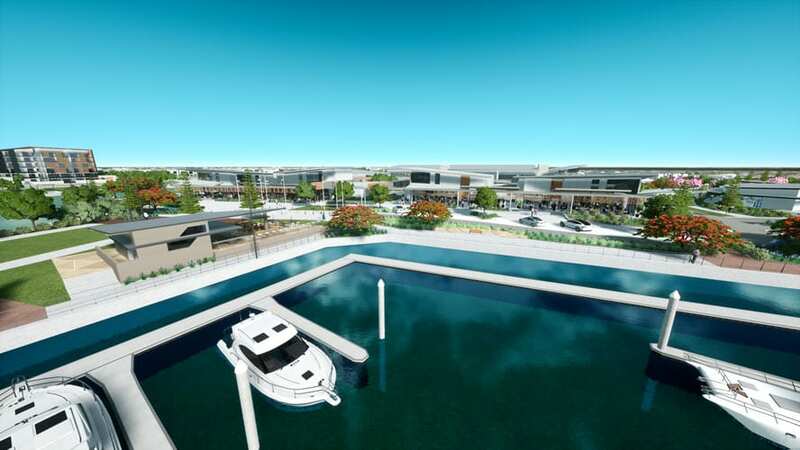 The PWMPC will be located in the commercial hub of the new Pelican Waters Town Centre which will include a dynamic mix of waterfront dining and retail outlets and an adjoining marina. The residential component of the Town Centre is currently under construction and has approval for 2,100 dwelling units which includes houses, townhouses, villas and apartments. This means the Town Centre will accommodate approximately 4,000 new residents all within 500 metres of the PWMPC. A 60 apartment retirement community and child care centre (already completed) will compliment the offerings in this vibrant commercial hub.